The main characteristics of a 100 Euro Goslar gold coin are: it weighs exactly 15.55 grams, the equivalent of 1/2 troy ounces of gold, it has a purity of 24 carats or expressed in a percent its purity would be 99.90% pure gold. Another attribute of this German gold coin issued in 2008 will be its diameter of 28 mm. 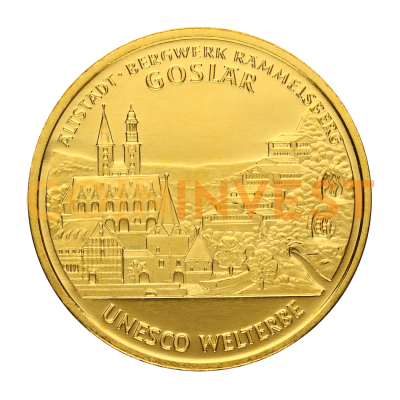 On the obverse of the 100 Euro Goslar gold coin it is depicted the medieval center of the Goslar town with its famous medieval cathedral. Other inscription present on the obverse are: "UNESCO WELTERBE, ALTSTADT, BERGWERK RAMMELSBERG, GOSLAR". The reverse of the 100 Euro Goslar gold coin depicts the famous and always present German eagle, an inheritance that comes from the time when the Mark was the German currency. Apart from the 12 European stars on the reverse, at the bottom of the coin the letter "F" is inscribed which means that this particular 100 Euro Goslar gold coin was produced by the mint in Stuttgart. Also found on the obverse are the following inscriptions: "BUNDESREPUBLIK DEUTSCHLAND", the minting year "2008", and denomination of the coin "100 EURO". By investing in a 100 Euro Goslar gold coin, investors will benefit from 15.55 grams of pure gold, gold of 4 carats. It is a German gold coin that deserves to be kept and to diversify portfolios in a very cultural manner; it is especially a gold coin which will always be in demand. Therefore, a 100 Euro Goslar gold coin can easily be sold in a profitable manner at any time. It has another strong characteristic in the fact that it is an investment free of taxes. However, the strongest attribute of this German gold coin still remains the fact that is made of pure gold whose price is likely to continue to increase in the future. Collectors will fall in love with the obverse design of the 100 Euro Goslar gold coin, which is unique in the fact that depicts an engraving in gold of the city of Goslar. Its historic impact is so important that Goslar was included among the UNESCO Heritage Sites and so in 2008 was minted this spectacular gold bullion coin. Get coin comes incl. case and certificate.